Inder Loves Folk Art: A Brumby Skirt and a Thrift Store Shirt. Yeah, so just a few weeks ago, feeling very enlightened by Me-Made-May, I announced to y'all that "I make a lot of skirts. I haven't worn all of my me-made skirts yet. I could probably chill out on the skirts." Riiiiiiight. Famous last words! See, I love to wear skirts, and even more, I love to sew skirts. 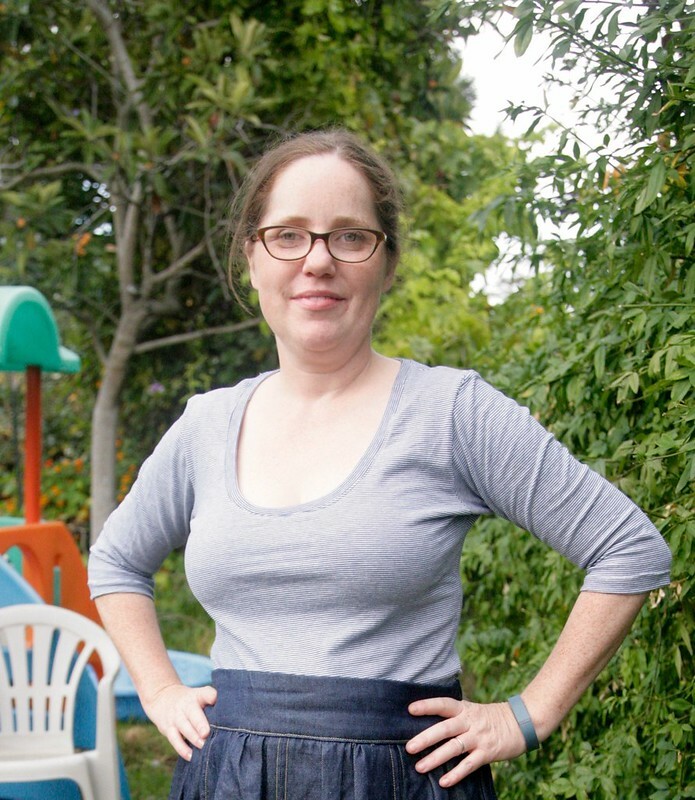 Skirts are fun, relatively easy and fast to sew, and don't require a full-bust-adjustment. Win win win! 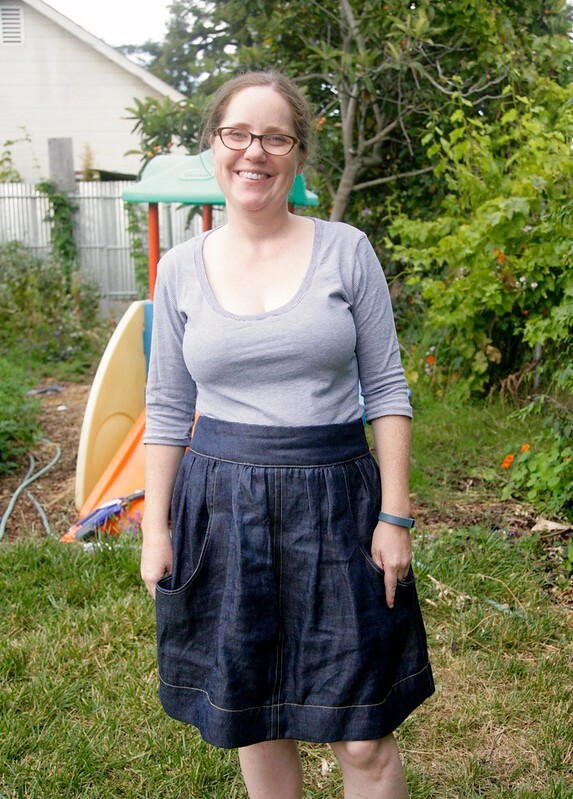 So that "resolve," such as it was, lasted about a week, until Megan Nielsen put out her new Brumby Skirt pattern. 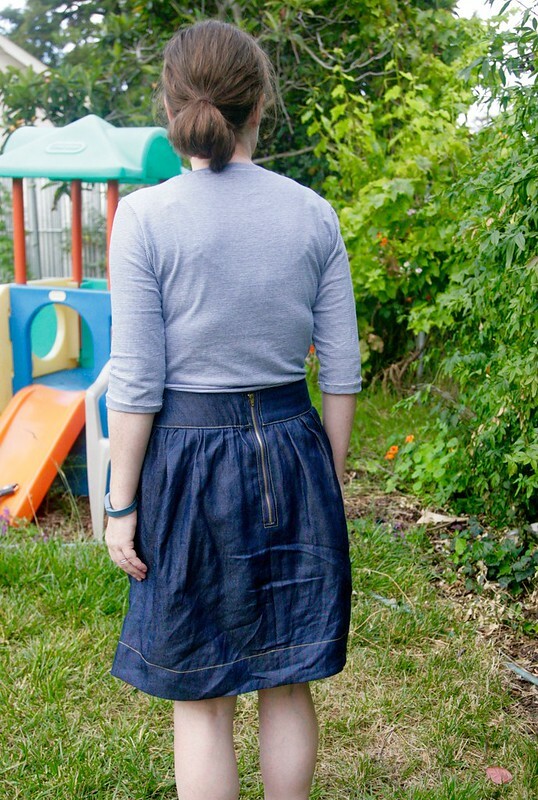 Now we all know I love myself a nice gathered skirt, but the Brumby Skirt is a simple pattern. So simple that I thought, for a second, "I could draft that myself." I actually did draft a gathered skirt with pockets a while back. But even though it was a simple drafting job, it was kind of mentally taxing and I missed the comfort and safety of following a pattern (that may sound crazy to some, but others will know what I'm talking about here). And my self-drafted skirt did not have such awesome pockets! Or an exposed zipper! Or a contoured waistband! You get the idea. I'm a pattern addict, and the Brumby was seriously calling my name. Anyway, I bought the pattern and made the skirt. And it turned out great! I pretty much copied Version 1 right off the pattern envelope, including using a dark denim and gold topstitch thread. What can I say? It's a great look, and I needed one of my own. I love the big slouchy pockets. The way the pattern is drafted, they gape open or stand away from the body of the skirt a little bit, which I happen to love. It's casual and fun and adds a little specialness to an otherwise basic skirt. The only change I made to the pattern itself was to add a few inches of length. I prefer skirts to hit at or slightly below my knee. This "denim" looks like a regular cotton denim on first glance, but it's actually a tencel/rayon blend denim, and it has a deliciously soft hand and drape. It hugs the body more than a stiff denim would, which is wonderfully flattering. It also wrinkles a lot more than a cotton denim would. You can't have it all. Because it is relatively soft, drapey fabric, I interfaced both the waistband and the waistband lining to give the waistband a bit more body and that seemed to work well. To sew this up, I threaded up my Singer 99 and my serger with navy thread and my newer model Singer with gold topstitching thread. Instead of changing threads, I was just moving from machine to machine, which was so much more convenient (see, you do need more than one sewing machine! you're welcome). My last experience sewing with topstitching thread was absolutely disastrous (yes, it was years ago, it was just that horrible), so I was nervous about using it again, and did a little internet research first. I found this wonderful collection of tips on Craftsy, and followed it to the letter, going very slowly and never backstitching, and it worked like a charm! One of the other interesting details about this skirt is the exposed zipper. For this, I followed the tutorial that Megan posted on her blog, which worked really well, although I feel duty-bound to tell you that the illustration provided in the instructions (I was following along on Megan's fancy app, which was great btw) is wrong wrong wrong. It shows you lying the zipper face down on the wrong side of the fabric to baste the bottom of the zipper to the skirt (right side of zipper to wrong side of fabric), when it should be the right side of the skirt fabric (right sides together). This could definitely get you in trouble but luckily I had the tutorial open too and was able to figure it out pretty easily. This skirt was not without its hiccups, however. I cut the skirt pieces out in a medium, but the waistband pieces out in large. Despite some measuring and trying on before I sewed the waistband on, the final skirt ended up being too large. Not hugely too large, but it sat much lower and was much less cute. This seems to happen to me a lot - I think I'm so paranoid about making things too small that sometimes I err on the side of making things too large! Well, it was messy work, but I ripped all of my beautiful topstitching stitches out and took it in on the sides, then sewed it back together again. I do love that the contoured waistband pieces on this skirt really allow for a flat and well-fitting high waisted skirt. Now that I've made this skirt, I would love to go back and change my Kelly Skirts and Lisette Skirt to have contoured, rather than straight-sided, waistbands. Such a small change and it really is noticeably more comfortable and flattering! I think this is one of things that I have long preferred about my quality RTW skirts and pants without fully understanding why. Who knew? In other, less exciting news, the top I'm wearing here was a thrifted turtleneck that I refashioned into a scoop neck top. I grabbed it because I liked the small blue stripes and the fabric felt very soft and high quality, but since I hate turtlenecks, I knew it would be cut up. First I just simply cut the pieces part on the existing seams. I cut off the turtleneck and cut a Plantain neckline. I then used the ribbing in the turtleneck (pieced) to bind the neck. Then I shortened the sleeves to three-quarters length and sewed the top back together, checking for fit. Because this was a relatively formfitting top (and in my size) to begin with, the final result is a rather figure conscious scoopneck tee, perfect for tucking into a gathered skirt. Sometimes the easiest projects are the most satisfying, am I right? Plus it always feels very virtuous to refashion an inexpensive thrifted item. I am pretty pleased with this new casual outfit, and I know I'll get a lot of wear out of these items. I'll be back here soon to share an outfit I made for Maggie recently, and I know I'm behind in blogging my me-mades. Skirts: I just can't quit 'em. What is your favorite garment type to sew? Great skirt and great refashion on that turtleneck! Turtlenecks remind me of my childhood in the '80s. Nothing but turtlenecks topped with crewneck sweaters. Ew. 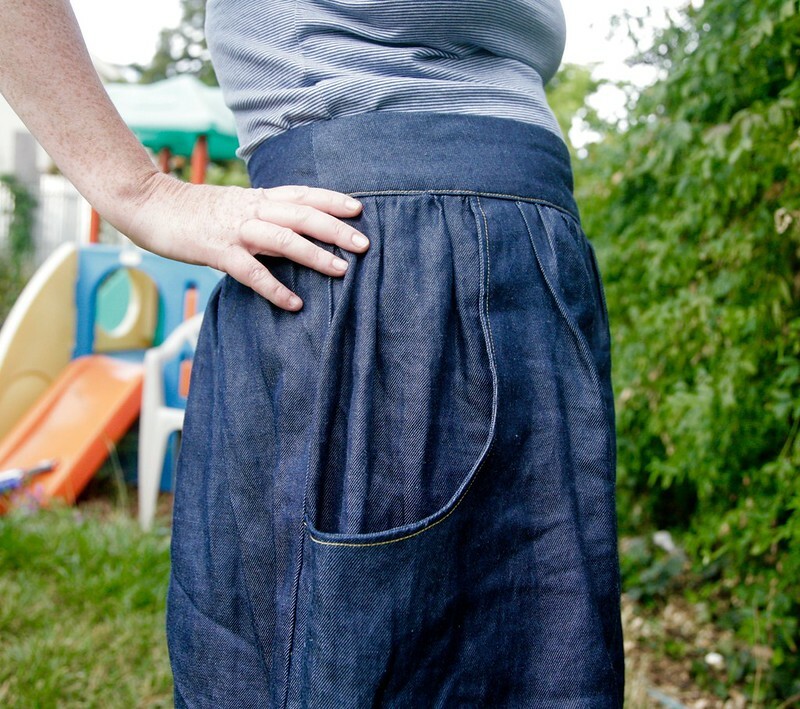 Re: favorite type of garment to sew: I think I am the opposite of you- I like making tops the best, mostly because my junk-in-the-truck is hardest to fit, so I am more apprehensive about skirts and pants. Love! I love it! 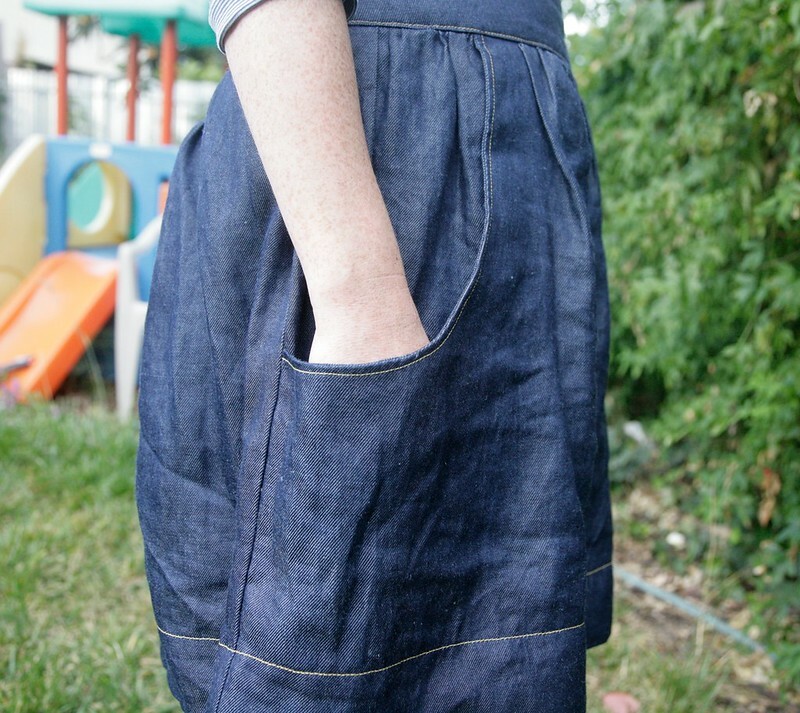 The drapey denim, the top stitching, the zipper, it is adorable! I am not sure how this skirt would work on my shape but you are tempting me to try it. I'm thinking I might need one of these Brumby skirts! Yours looks great - I can imagine wearing it every week... Like Meg I find tops the easiest to sew. Maybe because I haven't found the right bottom pattern yet. I got this pattern and I think it's next on my list to sew for myself. I have some dark denim but mine isn't as lovely and drapey as yours. I will have to check out the topstitching tips-- I don't think I've ever used top stitching thread before. I love how your outfit turned out! I'm sure you'll wear this a lot this summer! Love, love this whole outfit on you. I hadn't really taken much notice of the Brumby Skirt before but the details you point out are great. I totally have the same issue with erring on the side of making things too big. Trying to get over that one! Comes in part I think from the whole FBA dilemma thing - making things according to your biggest or average measurements. My 'thing' to make is dresses, dresses, dresses, especially sleeveless layerable ones. But it's what I wear most so I'm going with it. And you look great in skirts! Great skirt. You can't go wrong with denim and topstitching, unless of course the topstitching itself goes all wrong. Glad to see your success. Shaped waistbands are great, 'specially for those of us with a steep gradient twixt waist and arse! There are some fantastic instructions for tweaking this kind of waistband in the yet to be released Thread Theory Lazo pants pattern. I'd wear that skirt everyday and the big open pockets are reminiscent of a tied apron just made for collecting stuff. Bet Maggie puts things in there when you're not looking! Way cute skirt! Can't go wrong with denim, glad you got the topstitching thread to work, I still haven't worked up the courage to try it again.